Anyway,as usual I watch a lotttt of movies every month.Here are two from the five movies that I've recently watched. I watched this movie two weeks ago with my boyfriend and his siblings.I've watched the trailer before and I thought it would be a great movie.One night,the boyfriend suddenly bought the movie tickets online and said we should go watch it,now.haha. 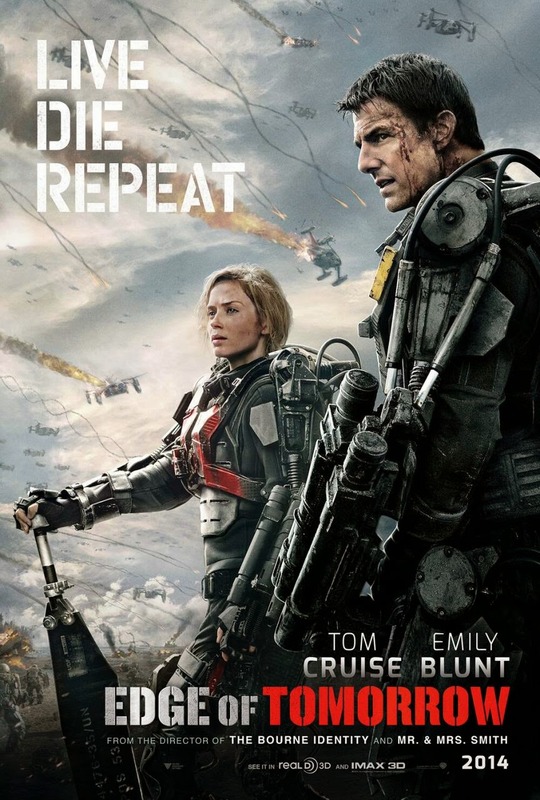 The saying in the poster-- Live,Die and Repeat is basically what the movie is all about.You live,you die and repeat all over again. The movie is about Major William Cage who's thrown into the army and his rank was stripped down so that he would have to actually fight in the war of..humans against..aliens who are called Mimics.They were a bit weird looking but then again..they're aliens.They look like..our own nerves system. While fighting Mimics,he got killed when he released a bomb and when he wakes up..he's back to where he started at Heathrow Airport.So yeah,SPOILER! The whole movie was about how Cage dies and then repeat his day all over again until he can finally kills the thing that controls all Mimics--which is called the Omega.Creative huh?haha In the process,he received help from Rita because she was also able to live,die and repeat previously. Anyway..what annoyed me was how he had to die and repeat his days over and over again.I'm pretty sure he had to repeat his day like..thousands of times!There was some hilarious scene involving how he died though!It was like Groundhog Day but this one involved avoiding death which is really really hard since dying is actually..imminent. But like what the boyfriend said,you have to applaud Cage's patience and tenacity..imagine living your worse nightmare over and over again?Also having to listen people talk the same thing over and over again?I honestly felt like poking my eye with a fork. There's a twist of course!There's always is.The ending is somewhat happy.I'd give this movie...3 out of 5 just because the action scenes were quite good.But I just didn't like the whole plot. My boyfriend LOVESSSS How To Train Your Dragon.He really loves the movie.So he was super excited when the second movie came out.We watched this movie last Sunday and I enjoyed it very much.It had a lot of great elements in it.Friendship,love,family,team work,loss and many more. 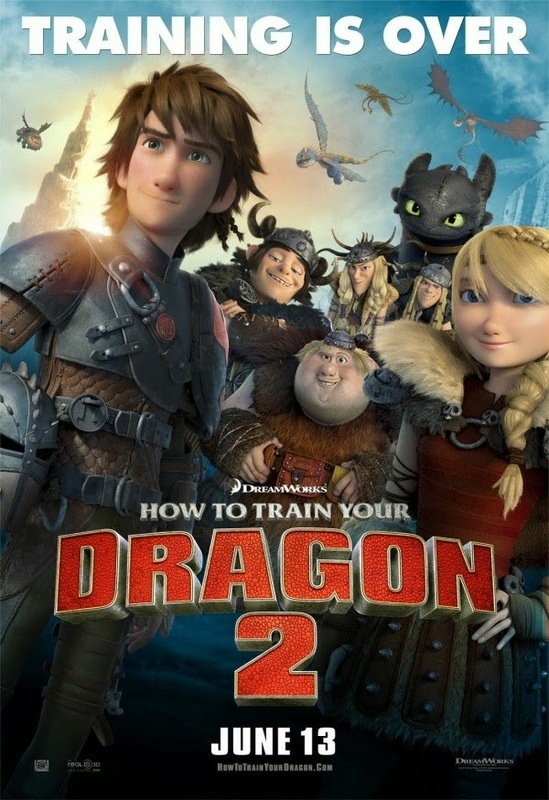 This movie takes place 5 years after the first movie.The town of Berk has made peace with dragons and basically everyone has their own dragon now.When Hiccup and Astrid went to check out a wildfire,they discovered a dragon trapper named Eret who claimed that their dragon ruined his fort. And that he was going to capture their dragons for Drago Bludvist.When Hiccup went back to Berk,he told his dad about this which prompted Stocik to close Berk's gate and ask the villagers to prepare for battle. Hiccup fled Berk because he wanted to reason with Drago to not capture the dragons.On his way there with Toothless(which is superrrrr cute! ),he met someone whom he never thought he would. There's an unexpected twist in the movie that's very sad.The animation in the movie is very beautiful..especially involving all of the dragons.I've to say that at the end of the movie,I felt like..I can't wait for the third movie. I'd give this movie 4.5 out of 5! More movie reviews to come-- The Wolf of Wall Street,Her and Snowpiercer!